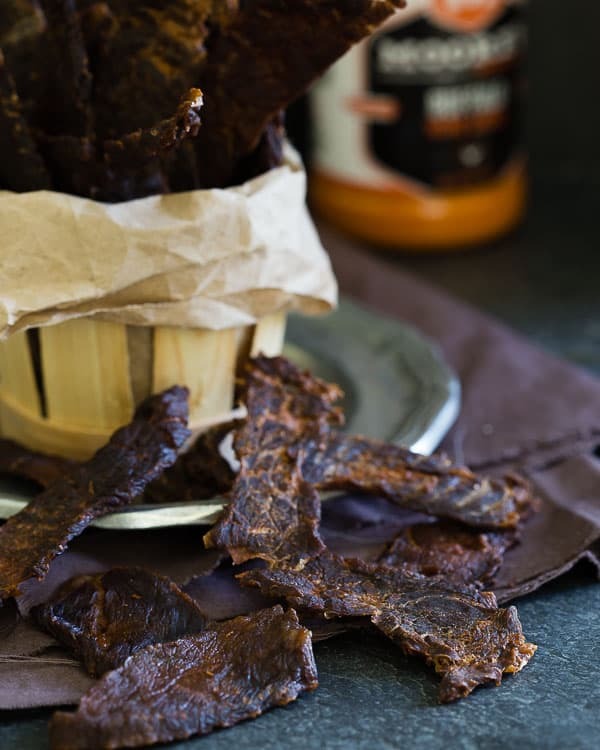 This buffalo sauce beef jerky is so easy to make at home, healthier and much cheaper than anything from the store. It has all the great flavor of your favorite buffalo wing too! When we went out west last year to Zion, Bryce and Horseshoe Bend I’m not even exaggerating when I say collectively, we probably spent about $250 on jerky alone. For 6 days we subsisted off beef jerky, Cliff bars and sports drinks and hiked 50+ miles. If only I had gotten my act together in the beef jerky making department a year ago, I’d be that much richer. To say we like beef jerky in this house is an understatement. Trader Joe’s runs are made solely for either coconut oil, nut butter or jerky each month (ok, and their bacon) because if we run out and I have no go-to protein snack on hand, things get ugly. I was fully prepared to make this in my oven since I don’t own a dehydrator until Brandy offered up hers and I happily obliged knowing it’d probably be a bit faster. Guys, for someone who has sworn completely off clutter and unnecessary gadgets in the house, I’m seriously contemplating buying my own dehydrator after this experience. In just four hours, I had perfectly crisp buffalo sauce beef jerky. I spent $10 on 1.8 pounds of top round, used a cup of buffalo sauce I had on hand and easily made 5-6 bags worth of Trader Joe’s sized beef jerky. Those bags cost $4.99 each. Do the math. The flavor combinations are endless (and I have oh so many running through my head for next time starting with lime + jalapeno because how good does THAT sound?!) but for this first go-around I decided to do all the flavor of your favorite buffalo wing in beef jerky form. It came out as amazing as you’d imagine. Go forth and get your jerky on. And if you do pull the trigger on a dehydrator think of all the things you can make in it besides jerky, like pizza kale chips and tart cherry fruit leather! Freeze beef for about 1 hour so that it's easier to slice. Remove from freezer and cut into long thin slices. Place the beef in a large bowl, add the buffalo sauce and salt to taste and toss to make sure each piece is coated in the buffalo sauce. Let marinate overnight or for at least 6 hours. Place each piece of beef in the tray of a dehydrator (*see note below for alternative oven method) and dehydrate according to your machine, usually around 160 degrees. Check beef after 3-4 hours for crispness. Depending how thin you sliced it, it may be ready at this point. Leave any thicker, soft pieces in the dehydrator until fully dried. Alternatively, you can place marinated beef on a cooling rack on top of a baking sheet and bake at 175 degrees for 4-6 hours (or until fully dried). 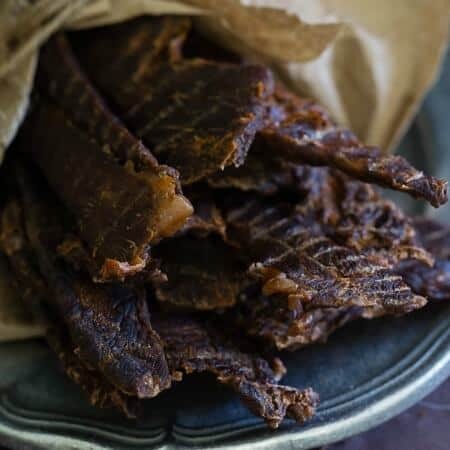 I never in my life would have thought to make homemade beef jerky, I can’t believe how easy it is! I love Beef jerky but refuse to dole out that kinda cash for it from the store – and it’s usually not even that good! I would definitely try yours first!! YUM! Brilliant with the buffalo sauce! My husband has no problem dishing out hundreds of dollars on jerky. It’s his favorite. Love this recipe! I bought my husband a dehydrator for Christmas but so far all we’ve made are chips. 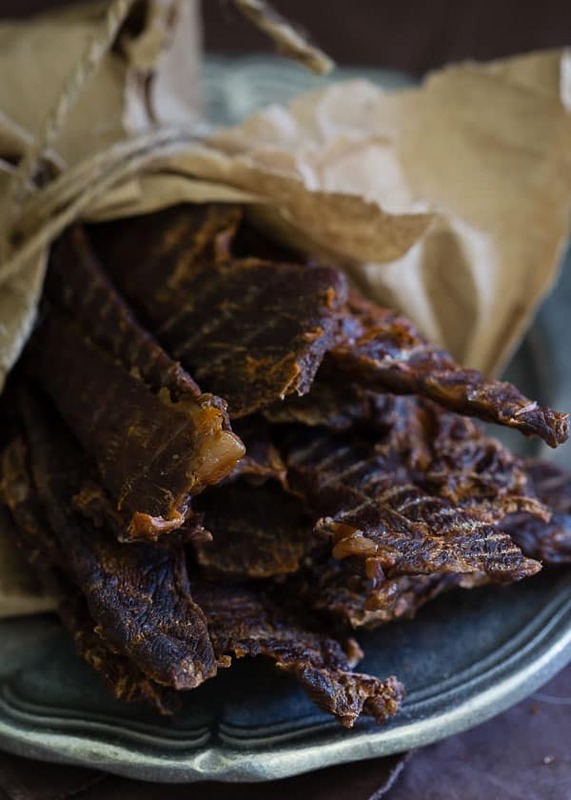 We’ll be making this jerky soon! I totally know what you mean about Trader Joes runs. Coconut oil and bacon. Their bacon is the BEST! Going to make this, Gina- I love jerky and I hate how expensive it is!!! I went on a road trip a few years ago where we did the same thing and spent an absurd amount on subpar jerky. I wish we had this recipe! $10 to make all of that is a fantastic price. The recipe looks great! Congrats on a successful jerky making experience. Buffalo sauce? For wings I use. 1 stick of butter, 1/2 cup Franks hot sauce and. 1Tbsp Worcester sauce. Is that what you mean bu buffalo sauce? They sell something called “buffalo sauce” – that’s what I’m referring to. I believe the brand I have is Texas Pete.